I love Hawaiian bread, it is my favorite way to eat a hamburger. I have tried many times to make it and it was never sweet enough. I finally decided to just substitute ingredients in my faithful yeast bread recipe. They turned out excellent. Sweet and soft! Who would have thought a simple swap of water and milk for pineapple juice was all I needed to do. 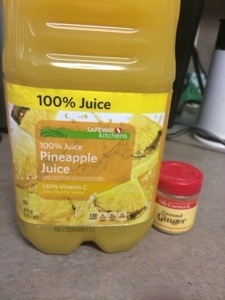 Plus…a touch of ginger. WOW! Dump all your ingredients into your bread machine on the dough cycle. If you don’t have one just mix and knead for 12 minutes before letting it rise for an hour. 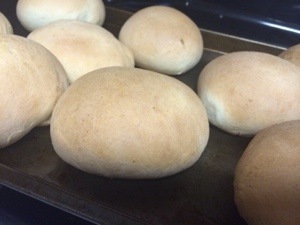 Once the dough has completed the first rise, divide it into 8-10 buns. Let rise one more time for about 45 minutes. Bake on 350 degrees for 18-20 minutes. YUM!